This paper is great for the scrapbooking genealogist. 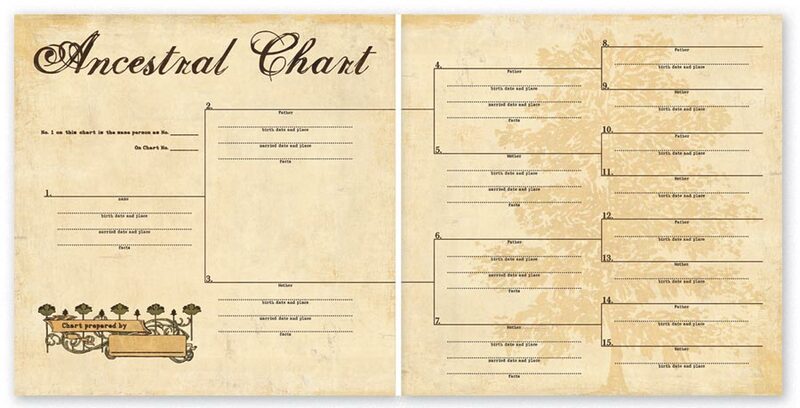 'Ancestral Chart' from Paper Loft is a lovely four generation pedigree chart. A designated title box to write the name of your family in, and all you have to do it simply fill in the blanks. The front of the page allows for two generations, with the back having room for two more - yourself, parents, grandparents and great grandparents. With plenty of room to write, both in the length of the line and well as the distance between each line, the page allows you to fill in names, birth date and place, married date and place and facts about each person.